A K-9 Cemetery? Yes there is. I didn’t know that there is a cemetery for dogs until we found it out when we went to Nayong Pilipino. It was good that we walked after all, we were able to discover this place. We stopped for awhile and checked it out. 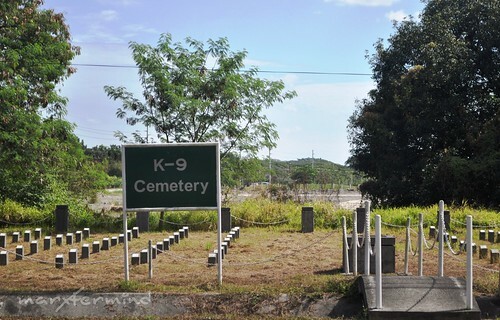 The K-9 cemetery was established by Americans before they left the US Air Base. Now, it was being eyed as a full-fledged cemetery for pet dogs. The uniform, narrow tombstones were interesting because of the name written on it. (Nakakatuwa yung mga name pero bakit kahit isang pangalan wala akong naalala, kaya wala akong mabanggit pero nakakatuwa! Hehehe). Aside from that, there’s a written code consist of numbers and letter. It’s good to think that there is such place for dogs. According to an article, there are about seven million dogs in the country and rural areas don’t have much problem with disposing of dead dogs, unlike in urban areas where spaces are limited. People in urban areas live in apartments and homes without space for burying. Apart from protecting the health of people, providing proper burial places for dogs could also augment the income of the local government, which could charge minimal fees for the use of burial grounds. To read the full article, please click here. 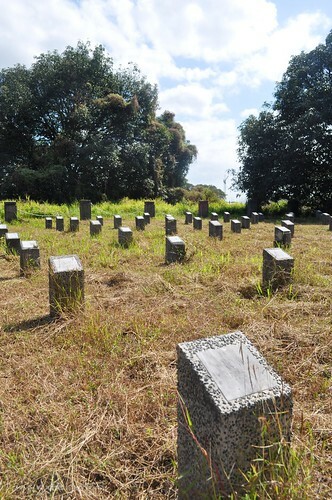 The k-9 cemetery is just a kilometer away from the Nayong Pilipino. To get there, from the Clark Free Port Main Gate take the Route 1 Duty Free Shops bound jeepney. Tell the jeepney driver to kindly unload you at the Parksons Duty Free Shop. And from there, you can easily hike for a kilometer or less for 5 minutes. Enjoy! @chyng, tama! buti may cemetery na for dogs, galing! haha! ang sosyal ng dogs! treated as hero soldiers!